Man sought in connection with reports of indecent exposure at Seaton Park in Aberdeen. Police have launched an appeal after a flasher exposed himself at a park in Aberdeen. 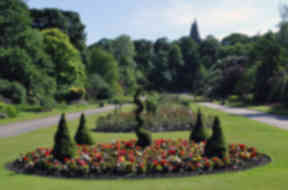 Officers are looking to trace a middle-aged male in connection with two reports of indecent exposure at Seaton Park. The first incident happened at around 8.05am on Tuesday, November 13, within the park at the junction with Don Street. The second incident happened at around 8.25am on Wednesday at the bottom of the set of steps which lead from Hillhead Halls of Residence into the park. Detective inspector Norman Stevenson said: "Officers would like to trace a man in connection with the two incidents who may be able to assist with enquiries. "He is described as around being aged between 30 and 40, around 5ft 11in to 6ft tall and of a slim build with a gaunt face and prominent cheek bones. "In the most recent incident he was described as wearing gloves, a navy jumper with white on the sleeves and grey trousers. "No one was approached or injured as a result of these incidents however naturally the circumstances have been alarming. "We would urge members of the public using the park and the area to remain vigilant and report anything suspicious to police. "Officers carry out regular patrols in the area however I would urge anyone who recognises the description or has any information in relation to the incident to contact police."